Amantani is one of the islands located in Lake Titicaca in the region of Puno, in the southern end of Peru. Amantani can only be reached by boat, taking between 2 and 4 hours from the nearest towns (Capachica or Puno), depending on the type of boat used. Given the unique cultural, socioeconomic and geographic characteristics of Amantani, we pondered how such determinants may have impacted the health of its population. After conducting a comprehensive search, we found no relevant information on the scientific literature or official reports. 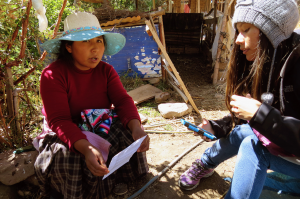 In order to measure the health needs in Amantani, and the other islands in Lake Titicaca, we developed and validated a health needs assessment tool based on a national questionnaire. We then used this instrument to estimate the current health situation of the settlers in Amantani. We used simple random sampling to select 150 households using Google Earth. In the map of Amantani we visually identified all the structures that could correspond to households, and assigned them a unique number. Then, using a random number generator, we randomly selected 150 households to be included in the study. Subsequently, we identified the coordinates of each of these houses, and created a geographic layer with their location. After the instrument was validated by experts, a version of the electronic questionnaire was coded using the London School of Hygiene and Tropical Medicine Open Data Kit. After coding the questionnaire, we downloaded it to nine mobile phones that were provided by the university (with power packs) for the fieldwork. Knowing that we needed at least five interviewers to survey the required sample size, and without funding available to pay salaries, we recruited volunteer fieldworkers through Facebook. We created a fan page in Facebook for the recruitment of volunteers. The response was incredible, and we were able to recruit nine health professionals for survey administration. Each of them were given a mobile phone with the questionnaires and maps of selected households downloaded. After performing the questionnaire,the coordinates of each of the household were taken before the survey for the geographic analysis.